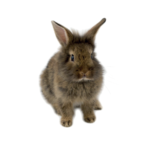 Rabbits sold online via classified ads in the what they did UK: when, why, and how many? 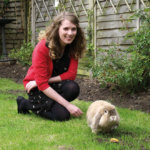 When Vikki Neville started her internship at the RWAF, the team were keen to investigate the problem of rabbit rehoming. Elaine Line and Keith Hinde had been collecting data on rabbits advertised via online classified websites for some time, which not only allowed them to count the number of rabbits rehomed online but also gave them the opportunity to look at the reasons why people were doing so. 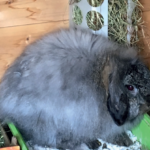 They trawled through the data, picking out the reasons the owner gave for rehoming their rabbit, and then looked for trends in the data that might hint at the real reasons for rehoming. They’ve just published their findings in the Journal of Applied Animal Welfare Science – a peer-reviewed journal co-sponsored by the Animals & Society Institute (ASI) and the American Society for the Prevention of Cruelty to Animals (ASPCA). How many rabbits were advertised online? They found that 7,315 different adult rabbits were advertised on the website Preloved in 2016 alone. The average age of these rabbits was 14 months, and most were less than two years old. The average lifespan of a companion rabbit is four to thirteen years (depending on size), so these rabbits were very much in the first flush of youth. What reasons did people give for selling their rabbit? The main reason people gave for giving up their rabbit was that they didn’t have enough time to care for the rabbit (21%), closely followed by issues with housing such as moving home (16%) and a change of circumstances (14%). In 10% of cases, the caregiver said that their child was no longer interested in the rabbit. What does the data suggest is the real cause of rehoming? When they looked at the number of rabbits advertised for free in each season, they noticed a significant spike in the number of rabbits advertised during the winter. There are several possible reasons for this. Firstly, most companion rabbits are housed outdoors, so in winter when the weather is cold and rainy, cleaning is likely to become an extra onerous task for most caregivers. Inclement winter weather could also influence how often caregivers interact with their rabbit; perhaps caregivers had great fun sitting in the garden with the rabbit in summer, but not so much in winter. It’s also possible that interest in the rabbit wanes after Christmas when children receive toys that they find more interesting than the rabbit. Were there any findings that aren’t depressing? Yes! They found that the total number of rabbits advertised online had decreased over the last few years. In September 2013, a voluntary scheme was launched in which advertisements on several UK classified websites, including those investigated in this study, which contravened the Pet Advertising Advisory Group (PAAG) Minimum Standards were removed from the websites. So, it seems like this scheme has worked to reduce the number of advertisements. Of course, it’s possible that people are rehoming their rabbits through other websites that aren’t regulated or via other means. It seems like many people don’t know what they’re getting in to when they purchase a rabbit. That’s why the findings suggest that education is key. 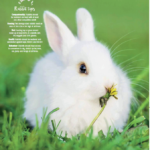 Giving potential caregivers information about the lifespan of rabbits and their substantial husbandry requirements, especially in winter, might deter the purchase of rabbits by caregivers unable or unwilling to care for them in the long-term. Working to prevent the impulse purchase of rabbits could also be useful in reducing the number of rabbits rehomed. Implementing legislation and shifting human behaviour is a slow process, but highlighting the problem rabbits face in an academic journal is an important first step towards getting people to pay attention to the issues. RWAF note: It was a pleasure to have Vikki as an intern and we are delighted that her time with us was so useful. We wish her luck for the future and we know that she is going to have a brilliant future ahead of her. Ref: Neville, V., Hinde, K., Line., Elaine., Todd, R., Saunders, R, A. (2018). Rabbit relinquishment through online classified advertisements in the United Kingdom: when, why, and how many? Journal of Applied Animal Welfare Science. Time flies: are you taking the time to protect your rabbits from flystrike? 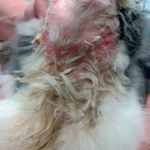 Flystrike is often a rapidly fatal disease, caused by flies, notably ‘Green Bottles’, laying eggs on damp areas of a rabbit’s skin and fur. When these eggs hatch, the maggots can eat the flesh of the rabbit causing severe pain, tissue damage and infections, and many affected rabbits will go on to die. You probably know that flies and their maggots are more normally associated with things that are already dead, and they are commonly to be found around our dustbins. However, if pet rabbits are not kept in clean conditions, or are unable to keep themselves clean, they too can be affected by flystrike. When it occurs, it is a serious welfare concern. Fortunately however, it can be prevented. are present at certain times of the year. SAVSNET has, for the first time, described the effect of seasonality on flystrike occurrence in rabbits. The research team found that flystrike was first recorded in the month of April, and almost 70% of cases occurred between June and August. In addition, for every 1°C rise in the average temperature, the risk of flystrike increased by 33%. Rabbits who were aged five years or more were almost four times as likely to have flystrike than younger rabbits, and unneutered does were over three times more likely to be affected than does that had been neutered. With 45% of the affected rabbits from the SAVSNET study either dying or being put to sleep, these risks are important for owners to keep in mind. There is lots of information available about measures to prevent flystrike, such as keeping rabbits and their environment clean, making sure rabbits do not become overweight (which reduces their ability to groom themselves), and most importantly, taking the time to check rabbits frequently for signs of dirty fur or flystrike. In addition, preventive treatments aimed at deterring flies from rabbit accommodation can be obtained from veterinary practices. If owners have any concerns, they are strongly advised to take their rabbit to see their vet immediately. SAVSNET collects data from veterinary practices and laboratories so that researchers can help improve understanding about what makes pets ill. Find our more information at www.liverpool.ac.uk/savsnet and on Facebook and Twitter @savsnet. We are sure you will all join in saying huge congratulations to Richard. As our Specialist Veterinary Adviser, Dr Richard Saunders has been recognised as an Animal Welfare Hero and been awarded the prestigious title of the Chris Laurence Vet of the Year at the 2018 Ceva Animal Welfare Awards. 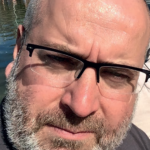 Richard was nominated for his dedication to improving pet rabbit welfare, in particular the huge amount of work involved in getting a new vaccine into the UK to protect all pet rabbits against an emerging deadly disease (RVHD2). We all owe Richard a huge debt of thanks for his success with the vaccine. So far it is estimated that in the region of 70,000 rabbits have been vaccinated thanks to Richard. Richard’s day to day work educating vets and clients on the needs of rabbits as pets has been as vital as his work on the vaccine. Rabbits are amongst the most neglected of pets, and people like Richard who raise awareness of the needs of the species, have a huge impact on the welfare of these hugely misunderstood pets. At the start of the Easter holidays we were horrified to see that there were rabbits in the terminals, being offered as stress relief for travellers. Obviously a busy airport is no place for rabbits. Not only will this have been stressful for them, but the biosecurity risk was a real concern. We contacted the company that provided the rabbits and the local authority responsible for the airport and they began to investigate. We do have a contact at Heathrow airport and we also contacted them and discussed our concerns. We also shared our concerns on social media, where of course Heathrow was inundated with messages pointing out the obvious; it was a bad idea. We’re not exactly sure what did the trick but within an hour Heathrow had confirmed that they would cancel the event. Thanks to Heathrow for acting so swiftly and to everyone who contacted them. always a busy time for the media and we were really delighted to be invited on the BBC Radio 4’s ‘You and Yours’ to discuss the Easter Amnesty. We then did a live interview for BBC Radio Gloucester and then a pre-recorded session for BBC radio Somerset. We also had a great two-page spread in the ‘Healthy Pet Guide’, which was inserted in the Mail on Sunday, so had great reach, and also a brilliant one page article in ‘Yours’ magazine. 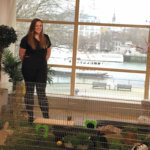 As if that was not enough, during the Easter holidays we worked with our friends from Burgess Pet Care on the set of This Morning (thank you to Runaround for providing the binky box and tunnels), and it was a really great piece promoting rescue rabbits. We were behind the camera making sure the right message was given to the millions of viewers. 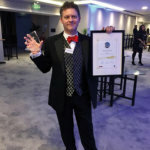 From there we went straight to Birmingham to the CEVA awards where we celebrated Richard Saunders being recognised as a Welfare Hero for his huge amount of work involved in getting the RVHD2 vaccine into the UK. We then spent two days with Burgess at the British Small Animal Veterinary Association (BSAVA) Congress, talking to veterinary professionals and launching Rabbit Awareness Week. It’s great to work with other such dedicated people. The power of social media worked again when we shared a small hutch for sale on Dunelm’s website. Dunelm very quickly removed it from sale and promised to look into their range. If you see something that worries you please share it with us on one of our social media platforms. Once again this year Pets Corner, Pets at Home and Jollyes suspended sales of rabbits over the Easter period. Good news, especially with the release of Peter Rabbit in cinemas. We’d like to thank these retailers for taking part in the Easter Amnesty. This is the time of year when rabbit sales peak, and people need to be reminded about how to properly care for pet rabbits so please keep sharing our ‘A hutch is not enough’ video.